Note: Draft may change depending on motor selection, amount of fuel, and gear added. 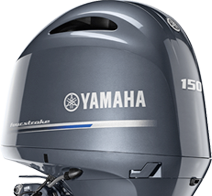 *The usable fuel capacity will be affected by factors such as EPA-required fuel system components, temperature, and boat loading which may reduce the usable fuel capacity by 10%. The smaller gauge panel allows room for more electronics. The switch panel has stainless steel toggle switches with circuit breaker protection. Also shown are the 2 stainless steel drink holders. The center console features forward facing seat with 13 gallon livewell/baitwell, 6-stainless steel rod holders, storage compartment, fold-down stainless steel grab rail, removable windshield, and stainless steel 5-spoke wheel with power knob.